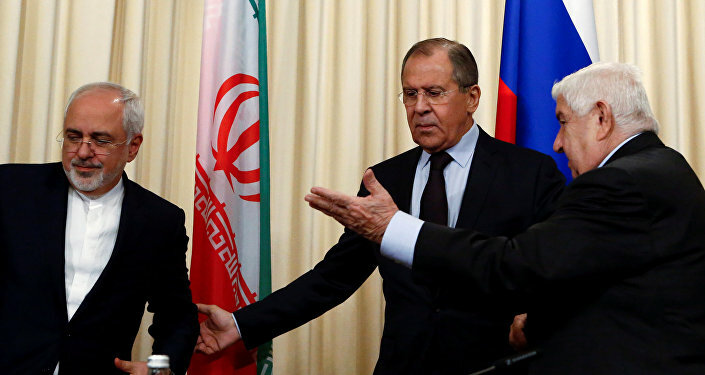 Russian, Syrian and Iranian foreign ministers held a trilateral meeting in Moscow on Friday to discuss issues surrounding the settlement and resolution of the Syrian conflict. MOSCOW (Sputnik) – The meeting was carried out a week after the reported chemical weapons incident in the province of Idlib and subsequent US cruise missile strike against the Ash Sha’irat airbase. The suspected chemical weapons incident in Syria's northwestern province on April 4 claimed dozens of lives, including those of children. Blaming the attack on Syria's President Bashar Assad, the United States launched a cruise missile attack on the government airfield in Syria's Homs province overnight on April 6, which left at least two civilians from a nearby village and five Syrian servicemen dead, according to Homs Governor Talal Barazi. The Syrian government has denied using chemical weapons against its own people and stated it did not possess such weapons. Syrian Foreign Minister Walid Muallem called the trilateral meeting a "strong message" after the US missile strike on the airfield. "This meeting is a strong message after the US aggression in Syria," Muallem told reporters. Russian Foreign Minister Sergei Lavrov stressed that all participants of the meeting agreed that the US strike was "an act of aggression, a flagrant violation of the principles of international law and the UN Charter." The Russian diplomat went on to say that Russia, Iran and Syria had jointly insisted that the United States and its allies respect Syrian sovereignty. "We will insist on the strict fulfillment by all without exception of those obligations set forth in the UN Security Council resolution, including full respect for the sovereignty and territorial integrity of the Syrian Arab Republic," Lavrov said. He asserted that attempts to overthrow the Syrian government embodied in last week’s missile attack on the airbase would fail. 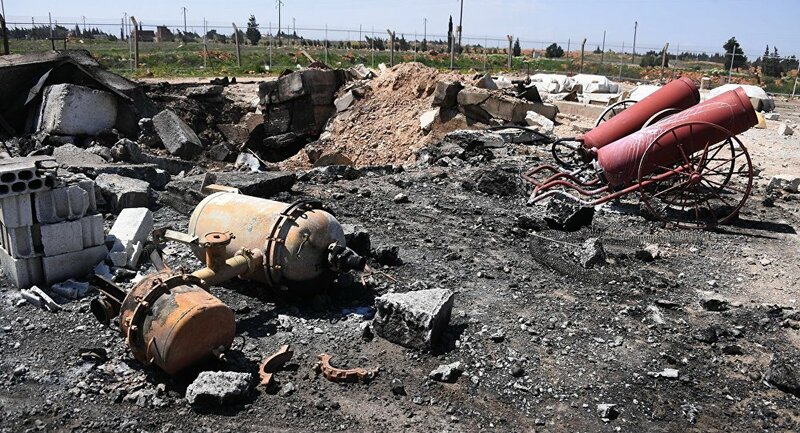 Lavrov said that Russia’s proposal on conducting a comprehensive, independent investigation on the circumstances surrounding the Idlib attack was being met with resistance. "We feel resistance to the proposal to conduct an independent, objective investigation, which was demonstrated yesterday at a special session of the Executive Council of the Organization for the Prohibition of Chemical Weapons," the minister said. He pointed out that those who were creating obstacles for the investigation must have something to hide. "Attempts to block the proposals of Russia and Iran to establish an independent commission to conduct an impartial, objective investigation only indicate that those, who are trying to do so have a bad conscience," Lavrov said. He continued to note that there existed evidence which proved that the Idlib incident had been staged. "There is growing evidence that this was staged, meaning the incident with the use of chemical weapons in Idlib province," Lavrov said. Citing an expert opinion, Russia's top diplomat stated that "there are too many inconsistencies, discrepancies in the version used to justify the April 7 aggressive action." Iran's Foreign Minister Mohammad Javad Zarif said that chemical weapons could not be used as an excuse to carry out any action against the sovereignty or territorial integrity of an independent state. "The use of chemical weapons as a pretext for taking actions against the sovereignty and territorial integrity of an independent state and a UN member is very dangerous. The international investigation is required in this case… It is necessary to prevent such actions in the future," Zarif said. He noted that it was important the investigation of the suspected attack be conducted at the scene of the incident, rather than abroad. "It is not possible to investigate this issue remotely. It must be investigated on the ground. When on April 4, Syria was accused, we have immediately demanded an investigation, we must establish the fact. Unfortunately, the United States took an aggression even before the investigation. Thus they did not want the fact to be established. And they wanted to use it for their political goals. We re-emphasize that the investigation should be conducted on the ground," Zarif told reporters. Zarif said that all parties to the meeting agreed to boost cooperation on Syria, specifically in fighting terrorism, reestablishing the country's political process and conducting an investigation of the Idlib incident. "We shall increase the level of cooperation on the international level. The first track is the investigation of his act, of this incident … The second, international cooperation on fighting terrorism and extremism … The third direction is restoration of the political plan," Zarif said after talks with Muallem and Lavrov in Moscow. According to Lavrov, the parties also discussed preparations for new Syrian crisis reconciliation talks in Astana, which are scheduled for next month. "We assign an important role in our efforts to the Astana platform, which also stimulated the Geneva process, and we discussed preparations for the next meeting in Astana," Lavrov said. 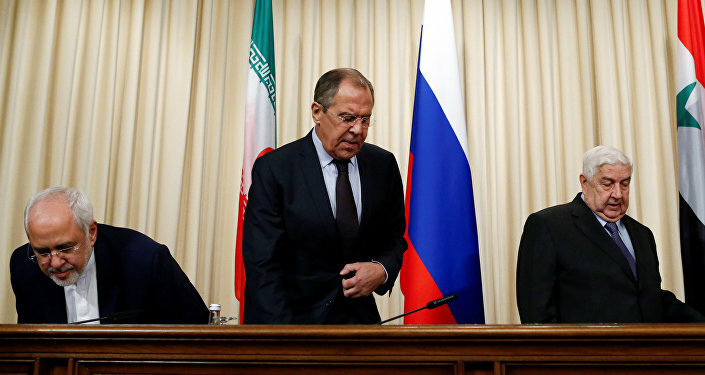 The Russian foreign minister said the Astana talks in May would be preceded by Russian, Iranian and Turkish expert consultations in Tehran next week.